As we all know Ricotta is suppose to made from whey and not milk. Even though the whole milk version is not bad, nothing comes close to the real deal. I make milk Ricotta every time I fetch milk, which is about once every ten days. but only can make real Ricotta after I made a hard cheese, which is not every week. 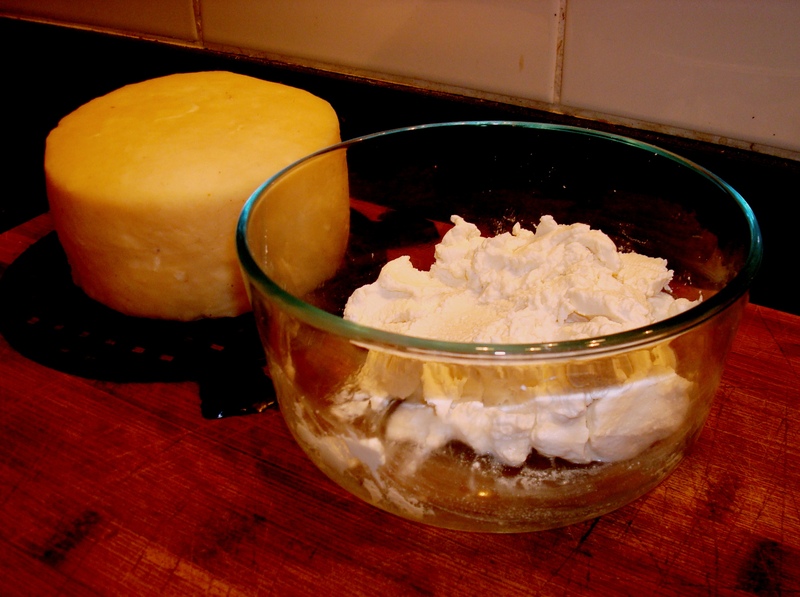 Last night the Montasio went well and after it was in the press, I made some Ricotta with the whey. Following breakfast and lunch, I had to be quick, otherwise there would have been no product left to photograph. Even though the yield from whey coming off ten liters of milk is not a huge quantity, but it made up in quality. 50 g Heavy cream – I made my own milk separator – simple and cheap – and will blog about it soon. Ladle the curds carefully into a ricotta colander lined with fine muslin cloth. When all the curd is in the colander, allow to drain for about ten minutes and when no more visible moisture is present in the curds, then mix in the starter. Store in refrigerator for up to ten days (It never lasts that long in any case). Thank you for sharing the information – it is very interesting and I have never heard of this before – will have to try ir soon. No I do not mind sharing other posts, as long as they are supporting the case. Have a good day and let me know when and what cheeses you are making. All the fermented stuff – Bread, cheese, wine and meats (especially salami) plus fresh fruit and vegetables and you need no more. Sounds all wonderful!! It is not that difficult to become 80 – 90 % self sufficient and it is a wonderful experience that provides not only food for the body, but also the mind. Please let me have your onion recipe – sounds grate and I love onions, but have never tried fermented ones – must have it please! Have a good day! Pity there wasn’t any left to bake…baked ricotta is a reminder why we get out of bed on bad days. That is such a waste. Forget the thrift, it’s a waste of really good quality food.